Map of the Arabian Desert ecoregions as delineated by the World Wide Fund for Nature. Satellite image from NASA. The yellow line encloses the ecoregion called "Arabian Desert and East Sahero-Arabian xeric shrublands,"  and two smaller, closely related ecoregions called "Persian Gulf desert and semi-desert"  and "Red Sea Nubo-Sindian tropical desert and semi-desert." National boundaries are shown in black. The Arabian Desert encompasses almost the entire Arabian Peninsula, blanketing the area in sandy terrain and seasonal winds. Encompassing almost 900,000 square miles (2,330,000 sq km), the Arabian Desert contains Rub'al-Khali, one of the world's largest continuous bodies of sand in the world. As a geographic area, the Arabian Peninsula is often considered impassable, due to extremely dry environment and scarcity of visible vegetation. Despite the inhospitable terrain, however, the Arabian Desert has served throughout history as a commercial passageway between the Middle East and North Africa. While it appears inhospitable and barren at first glance, it has proven to be a valuable source for natural resources, including oil, natural gas, phosphates, and sulfur. It also covers a vast reserve of underground groundwater, trapped beneath the sands since the Pleistocene Age, which has in recent years been tapped and used for irrigation in the region. Home to human populations for over 3,000 years, the earliest inhabitants of the region were the Bedouin, a nomadic civilization that used the lands of the Arabian Desert as a breeding ground for camels. Saudi Arabian Desert, August 2006. A large proportion of the Arabian Desert lies with the political borders of Saudi Arabia. However, the Arabian Desert is far too vast to fit within the political confines of a single nation, and spills over into neighboring countries. A significant portion of the desert reaches into Yemen in the southwest and Oman on the eastern border. Along the coast of the Persian Gulf, the Arabian Desert extends into the modern sheikdoms of the United Arab Emirates and Qatar. The desert continues its expansion northward from Saudi Arabia as well, reaching into Kuwait and Jordan. Traces of the Arabian Desert are also found in Egypt and Iraq. Encompassing almost 900,000 square miles (2,330,000 sq km), the Arabian Desert contains Rub'al-Khali, one of the world's largest continuous bodies of sand in the world. The vast expanse of the Arabian Desert is formed through a series of natural boundaries that protect the sandy dunes and keep the dusty winds inside the desert. The most prominent borders of the desert are the Gulf of Aden and the Arabian Sea to the southeast and south and the Red Sea in the west. In addition, the Persian Gulf and the Gulf of Oman lie to the Northeast and east of the desert. The glittering expanses of the sea only serve to highlight the dry nature of the desert and the lack of available water. To the north of the Arabian Desert, the harsh conditions of the desert climate extend up towards the Syrian Desert, making the desert seem especially foreboding. While the surrounding seas play a vital role in defining the borders of the Arabian Peninsula, the desert itself is contained within a ring of mountain ranges. 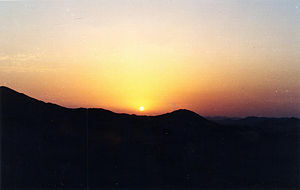 The most notable of the bordering mountain ranges is found in the southwestern corner of the desert belonging to Yemen. In this area Mount Al-Nabi Shu'ayb towers 12,336 feet above sea level. It has been measured as the highest point in the Arabian Desert, but is closely rivaled by Mount Al-Lawz (elevation 8,464 feet) in the northwest and Mount Al-Sham (elevation 9,957 feet) in the southeast. Along the northern edges of the Arabian Desert the landscape slowly elevates and blends into the topography of Arab Asia. The section of land where the desert begins to transform into a more elevated landscape is referred to as the Syrian Steppe, a treeless plain that is noted for its wild beauty. While the northern edges of the Arabian Desert are able to blend seamlessly with the geography of Asia, the southern portions of the desert are much more akin to the land forms found in Somalia and Ethiopia. Some scholars speculate that the dual nature of the Arabian Desert is due to a continental split in its early geological formation that broke the Arabian Peninsula away from Africa. While the Arabian Desert appears inhospitable and barren at first glance, it has proven to be a valuable source for natural resources, including oil, natural gas, phosphates, and sulfur. The Arabian Desert also covers a vast reserve of underground groundwater that has been trapped beneath the sands since the Pleistocene Age. In recent years the underground reserve has been tapped and used for irrigation in the region. The groundwater, coupled with water reclaimed through desalinization, has allowed the Arabian Peninsula to be far more hospitable to modern populations than those of the past. Oil reserves have also been tapped in recent years; however, exportation of petroleum products from the region is often interrupted by international crises like the Persian Gulf War. Like most deserts, the Arabian Desert is classified as a hyper arid climate. Climates of this type are distinguished by extremely low annual rainfall and low humidity. Both of these distinguishing features are clearly seen in the Arabian Desert, which boasts an annual rainfall of under 33mm and less than 15 percent humidity in the summer. While the overall dryness of the Arabian Desert is a formidable obstacle to human occupation, it is actually the extreme daily temperatures that mark the region as uninhabitable on a large scale. In the summer temperatures can reach a scorching 50 degrees Celsius (122 degrees Fahrenheit) in the heat of the day and plummet to extreme cold during the night. In the winter it is not uncommon for night time temperatures to reach below freezing. Mother & child camels in UAE, 2006. One of the most active forms of wildlife in the Arabian Desert are insects, who are able to survive in the sweltering heat of the sand dunes. Among the insects found in the region, the locust is often a cause of media attention. At one point the locust were considered a plague to the landscape, but has since been brought under control. Also making their home in the Arabian Desert, scavenging dung beetles, scorpions, and spiders play a vital role in the Desert ecosystem. Many of the insects that live within the region have developed a series of defensive mechanisms that allow them to avoid predators in the harsh climate. A prime example of this is the sting of the scorpions, which are potent enough to kill a small child. Many varieties of lizards also can be found among the wildlife of the Arabian Desert. One particular species, the dabb, is killed and roasted as a delicacy by the Bedouin. Other notable lizard varieties include the monitor lizard, which can reach an astonishing length of three feet. A close relative of the lizard, snakes also nest in the desert sands. Vipers are prominent among the snake population, as well as the sand cobra. However, due to the nocturnal nature of snakes, they do not often pose a large threat to human populations in the region. At one point in the history of the Arabian Desert, the region was home to a large mammal population. Despite the decline in herd populations, a few gazelles can still be found in wildlife preserves protected by the Saudi government. The few remaining gazelles are only a small part of the herds that once roamed the desert in abundance. As well as the gazelle population, the ibex population, a species of goat, has experienced a marked decline. However, the ibex population shows promise of returning to its former population after reintroduction to the wild from breeding in captivity. Much of the wildlife in the desert lives off the wide variety of plant life that can be found in the region. The plants that make the desert their home are, of necessity, adapted to the harsh environment and extreme weather. Most of the species are either able to survive on a very limited supply of water or are salt tolerant. Adaptations such as these allow the desert sands to bloom with vegetation after the spring rains. Despite native flowering plants such as the daisy, mustard, iris, and caper plants, the desert cannot support enough vegetation to allow it to be used as a grazing ground. This was not always the case, as the region was often used as a pasture for nomadic herdsmen. Overgrazing, however, effectively diminished the capacity of the area to support a large grazing area. In the oases of the Arabian Desert, date palms are often found in abundance. This fruit tree provides sustenance for both humans and livestock, preventing starvation in the harsh region. Also found in the oases are Juniper trees, (a prominent building material for the area), alfalfa, onions, melons, barley, and wheat. Saudi Arabian woman in the desert, 2005. The Arabian Desert has been the home to human populations for over 3,000 years. The earliest inhabitants of the region were the Bedouin, a nomadic civilization that used the lands of the Arabian Desert as a breeding ground for camels. While using the natural growth in the region to support their herd, the Bedouin also began a system of standardized agriculture in the desert. Utilizing the oases as fertile farmland, the Bedouin became noted for their cultivation of date palms and other crops. Eventually, however, the many tribes of the Bedouin were unable to sustain a purely nomadic lifestyle. Faced with the demands of new international political borders in the area, the Bedouin settled into the oases. The transition to a settled economy was accompanied with a decline in feuding Bedouin tribes, as grazing land was no longer contested. The discovery of petroleum in the region in 1936 ushered in a flood of Western cultural influence that severely threatened the traditional lives of the Bedouin. Perhaps the most significant change in the region following the discovery of petroleum was the increase in transportation options in the area. Now that trucks are widely used as a method of transportation, more Bedouin children have access to an education and other social services. While the discovery of petroleum in the area has brought some advantages to Bedouin society and the Arabian Desert in general, the natural resource has been exploited to a degree that has severely harmed the natural environment. Contention has also erupted between political entities based on the control and access to the petroleum fields. One notable example of a petroleum–fueled disagreement occurred in 1991, when 11 million barrels of oil were released into the Persian Gulf as a military tactic during the Gulf War. The effects of the oil release were necessarily catastrophic, devastating the entire aquatic ecosystem, culminating in the death of of thousands of water birds, whales, dolphins, and sea turtles. ↑ World Wildlife Fund, Arabian Desert and East Sahero-Arabian xeric shrublands, 2001. Retrieved October 24, 2007. ↑ World Wildlife Fund, Persian Gulf desert and semi-desert, 2001. Retrieved October 24, 2007. ↑ World Wildlife Fund, Red Sea Nubo-Sindian tropical desert and semi-desert, 2001. Retrieved October 24, 2007. ↑ John W. Wright, (ed. ), The New York Times 2007 Almanac (New York, NY: Penguin Reference, 2007, ISBN 0143038206), 456. Encyclopedia Britannica Online. Arabian Desert. Retrieved October 22, 2007. Kelly, Kathleen, and R. T. Schnadelbach. Landscaping the Saudi Arabian Desert. Philadelphia: Delancey Press, 1976. Lawrence, T. E. Revolt in the Desert. New York: George H. Doran Co., 1927. Ben-ʻEzer, Ehud, and Uri Shulevitz. Hosni the Dreamer: An Arabian Tale. New York: Farrar Straus Giroux, 1997. This page was last modified on 22 November 2016, at 21:10.